Persistent pain can be a major source of suffering for many and can present in many ways, for example after road traffic accidents, burns and war injuries. Pain also occurs with illnesses such as cancer, arthritis and back problems. Pain is not visible. Outwardly people may look ‘normal’ but are left with life-long severe pain that can affect their mood, relationships with family and friends and their ability to work or relax. We strive to help these people who suffer in silence - without support. 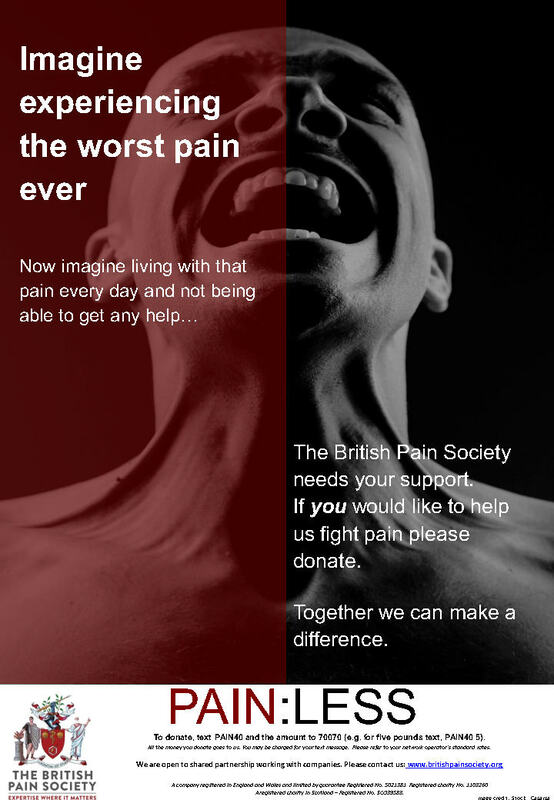 Please help The British Pain Society make pain visible and to treat it better. Want to learn more about our National Pain Awareness 'PAIN:LESS' Campaign? Click here to read our prospectus. How will my donation be used? Click here to learn more.